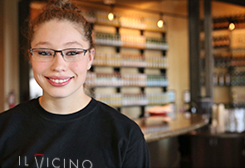 Il Vicino means “the neighbor,” and we take our commitment to our local community seriously. We’d like to help you and your favorite organizations—charities, schools, church groups, PTAs, soccer, football, basketball and Little League teams—raise the funds you need in a fun way that gets your community together! Visit your local Il Vicino Wood Oven Pizza location and speak to one of our managers to discuss a date that works best for your organization to hold a fundraiser. Create a flyer invitation to distribute to your group. The bigger your group, the more you will raise for your organization! During the event, have your group members present their flyers to the cashier when they order. Orders can include any food or beverage from our menu. After your food and fun, we’ll mail your organization a check equal to 20% of your total group purchases. It’s that easy! We look forward to your event. Ciao! Surprise your favorite pizza lover with an Il Vicino Wood Oven Pizza gift card! Cards are good at all locations and can be purchased in any denomination. Visit your nearest location and pick one up today.